Elegant Phalaenopsis, or moth orchid, is said to be the easiest orchid to coax into bloom. Although this is true, you must first be aware of the basic needs of this plant in order to be successful in cultivating it. Understanding how the moth orchid grows in its native environment is helpful in replicating optimal conditions at home. Phalaenopsis have thick roots and grow not in ground soil but above the ground on tree branches and rocks. They receive filtered sunlight under the jungle canopy and are accustomed to high tropical humidity. So, how do we imitate a jungle in our living room to coax these plants to bloom their best? Inadequate light is the most common reason that Phalaenopsis orchids fail to bloom. Moth orchids prefer bright, indirect or filtered light. Too much direct light and this plant’s leaves will burn; not enough light and it will not bloom. In the summer, this is easy – we can place our houseplants outside in a location selected specifically for the plant’s light optimal requirements. Phalaenopsis flower spikes, however, begin to form in the late fall to early winter when sunlight in the Northern Hemisphere is not as bright and days are shorter. Place your orchid in a south or southwest-facing window with a sheer curtain between the window and the plant. This should be enough of a filter to prevent sunburn. If a southern exposure is not possible, consider supplementing the winter light with a full spectrum grow light. In nature, lower temperatures trigger Phalaenopsis to bloom. Leaving your moth orchids outside for at least two weeks in the fall is generally sufficient to initiate a bloom spike. Do not allow your orchid to experience temperatures lower than 58 degrees Fahrenheit, however, or the orchid will be damaged or may even die. After this short period of cooler temperatures, a room that is comfortable for people, between 65 and 75 degrees Fahrenheit, is best. Orchid roots need oxygen to survive and should never be planted in soil. Often, Phalaenopsis orchids come planted in long fiber sphagnum peat moss. You must be very careful using this medium as it holds a great deal of water, which creates the perfect environment for root rot. The best growing medium for moth orchids is a quality orchid mix consisting of bark, perlite and charcoal. This mixture drains quickly yet holds adequate moisture for optimum root health. Bark, like all natural materials, breaks down over time and must be replaced with a fresh mixture every couple of years. Repotting should be done in late spring or early summer after blooming is complete. Orchid bark should be allowed to become almost dry, but never fully dry, before watering. To test, stick your finger into the planting mixture up to the first finger joint. Bark that feels almost dry at this depth should be watered. Hosing plants off in the bathtub or sink is a good way to water and allows you to rinse dust from plant leaves at the same time. Be mindful to drain any water that accumulates in the leaf crown after watering to prevent disease. Winter heat and summer air conditioning rob moisture from the air in our homes, which makes the environment more like a desert than a tropical rain forest. Low humidity can cause your orchid to abort its flower buds. Setting your orchids on humidity trays, grouping plants together and misting your orchids are all helpful methods in creating a more humid environment. You may also want to consider a humidifier in the same room as the orchids to promote an even more orchid-friendly environment. 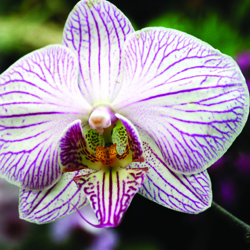 Phalaenopsis orchids should be fertilized regularly to promote plant health and good flowering. When the orchid is not in bloom, apply one-half the recommended dose of a complete fertilizer, 20-20-20, weekly or with each watering. During the winter months, reduce the frequency of fertilizing to once a month using a houseplant fertilizer labeled as a blossom booster at, again, one-half the recommended strength. Be certain to read the fertilizer instructions fully before using and never apply at a higher rate or with greater frequency than recommended as you may burn tender plant roots and perhaps kill your orchid. When your moth orchid has finished blooming, cut back the flower spike at the base. This will give your plant a rest and allow it to build up energy for its next bloom. You may also prune back to above a node in the flower spike, forcing the plant into a second bloom that will have smaller flowers and fewer blooms. Once you understand the unique needs of Phalaenopsis, you may find these orchids even easier to grow than you’ve believed, and you’ll enjoy their beauty and distinctiveness all year long.